Facebook acquired WhatsApp for a whopping $19 Billion and it follows after the deal, WhatsApp has a new update for Android users allowing one to officially hide your last seen time-stamp, your WhatsApp status and your WhatsApp profile picture within your app without having to install an additional app or constantly turn on and off your WiFi or data network. This was a service that was previously exclusive to iPhone users. Of course the WhatsApp-Facebook deal has nothing to do with this update. The update may have been pre-planned and Facebook’s acquisition of WhatsApp might just be another co-incidence. This new privacy feature is not available on the Play Store version of WhatsApp yet, but you will need to download and install the app all over again from the website using an apk file. This also shows that the feature is not available to everyone right now and WhatsApp could just well change its mind and withdraw it at any time. Before you hastily uninstall the version on your phone and install the one from the apk, be warned that you should always back your chats up. Once you have installed the new version of WhatsApp, you can find the new Privacy Tab in Settings and then Account Settings. To hide your last seen simply go to Settings -> Accounts – Privacy and change the options accordingly. 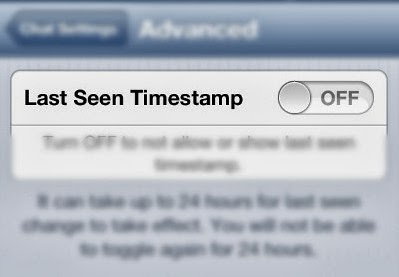 You can change settings for your last seen time-stamp, your profile picture and your status individually. For example you can hide your profile picture but keep your status visible or you can hide your profile picture but keep your last seen at time visible and more. Here’s how you manually get rid of it by simply hiding the time you were last seen on WhatsApp (without having downloading a separate blocker app). Disable your phone’s WiFi or data network. Open WhatsApp. Read messages if any. Send messages if you want to. Close WhatsApp. Enable WiFi or data network. The messages will be sent as soon as your phone connect’s to the internet without anybody coming to know the last time you accessed WhatsApp. Like a boss.